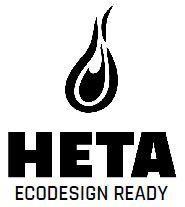 Heta is a manufacturing company based in Denmark, producing state-of-the-art modern and contemporary stoves. Heta are constantly evolving and strive to continually modernise and adapt in line with their comprehensive range of Heta stoves. Even in these modern times, traditional craftsmanship and professional pride remain key company values to them, and innovative and highly functional stoves are the result. ​ Heta take their environmental considerations very seriously indeed by designing and producing stoves that emit and produce some of the lowest levels of particulate pollution possible from a wood burning stove. With the renowned Heta clean-burning performance and efficiencies up to 86% on some models, these stoves are some of the best of the market. All models are tested and approved to meet and exceed the strictest of European requirements which includes the Norwegian, Danish, German Bimsch 2 and many are compliant to the UK Defra regulations. All of the models in the Heta range are already future proofed meeting the new 2022 regulations for ECODESIGN giving you complete peace of mind and confidence that you will not only be warming your hearth and home with one of best stoves out there but you will meet all the environmental concerns for the future. Sit back, relax and enjoy your woodburning experience with the HETA Ambition 8. Sit back, relax and enjoy your woodburning experience with a Heta Ambition 5. The Scan-Line Prestige is Heta's insert stove with versatile configuration options, in a stringent yet classic and timeless design. Inspire 55 is the larger brother to the Inspire 40 and 45 and offers a wide view of the fire burning brightly in the fire chamber. The Heta Inspire 45 is a wide landscape model with the same generous view of the flames. The Heta Inspire 40 Wood Stove with Log Store allows you to lift Heta's beautiful flames to make a more prominent statement in your room. Combining the qualities of a woodburning stove and a traditional thermal -mass stove. Combining the qualities of a woodburning stove with a traditional thermal-mass stove. Combining the qualities of a woodburning stove and a traditional thermal mass stove. The Scan-Line 820B is an elliptical wood stove in a stylish, modern design. Scan-Line 820 is an elliptical stove in a stylish, modern design. Features 3 thermastones to absorb heat and release it gradually. The Heta Scan-Line 551 features a large door for observing the flames. The Scan-Line 550 features a large door for observing the flames. The Scan-Line 520 can be customized to be an ideal addition to any home. The Heta Scan-Line 510 is the obvious choice for every home. The Heta Scan-Line 500 5kW Wood Stove is the obvious choice for any home. The ellipse-shaped tiles give this stove an attractive appearance whilst offering extensive heat storage. The smartly designed Heta Oura 300 7kW Wood Stove features a huge glass front for a fabulous picture of the flames. As the name suggests, Craft is a series of woodburning stoves which offers extremely customised solutions. Simple to use with discrete controls making a beautifully simple stove. The Heta Scanline Panorama is a elegant and modern stove. The Heta Inspire 40 4kW Inset Woodburning Stove maximizes the view of the fire. The Oura is the newest stove in the Heta range. The Scan-Line 800 is an elliptical stove in a stylish, modern design. With its compact modern design, the Scanline 7C is truly stunning. The Heta Oura 200 woodburning stove with side windows gives you an even greater view of the fire. The Oura 200 is a slim, smart woodburning stove with a huge glass front giving you a fabulous view of the flames. The Heta Oura 200 is now available with a ceramic finish to add a touch of stylish colours to your room. The Heta Inspire 45 is a brand new clean burn stove designed with a nominal output of 4.9kW and can be used for wood burning or multifuel use. Brand new for 2013 is the Heta Inspire 40 4.5kW multifuel stove, UK designed and built by Heta, one of Denmarks leading stove manufacturers. The Heta Scan-Line 7B represents the very best in modern technology with its lovely controllable flame and wonderful convection and radiant heat. The Heta Scan-line 7D features a beautiful flame picture that is raised to your eye level on its pedestal base. Make your stove an even more stylish, sculptural element of your home with side windows. Looking to add some height?? The Heta Scan-Line 95 perfectly combines ultra modern design with a panoramic view of the flames. The Heta Scan-Line 100 can be supplied with an integrated swivel plinth so that you can spread the heat and mesmerizing fire exactly where you want it. The Heta Inspire 55 is the newest model to the inspire series. If you are looking to add a touch of colour then the Heta Scan-Line 800 Ceramic is for you! The Heta Scan-Line 820B Woodburning Stove now incorporates a small baking oven. The Heta Scan-Line 820 6kW Woodburning Stove features a stylish, modern design.